Steve Sydenham Snr. has given us the good news that Yen is now safely back home with her husband and son after a long flight to Hanoi (Vietnam) followed by a 6 hour bus journey to her home. 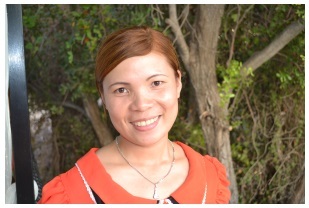 Yen has been in touch with Steve and has again thanked all of the people who helped her to return to her family. Steve has said “mission accomplished” and indeed it is as far as Yen is concerned, but after all his hard work organising a fundraising event to help Yen, he has now taken on another task and that is looking after the dogs that Hai and Yen had at Bamboo Beach and unfortunately had to leave behind. The two dogs are very confused and when Steve went to give them food and water he found them sitting outside the door where Hai and Yen lived, looking completely lost and wondering where they had gone. 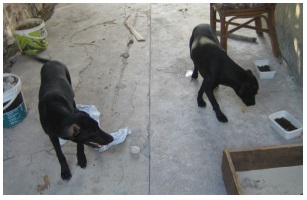 The good news is that KAR have them on their list for neutering, hopefully in the next ten days, but what then? Steve has 4 dogs and 2 cats and cannot possibly take on any more and whilst he is prepared to make sure these 2 dogs are ok he could do with some help in the way of taking turns with feeding and food donation (dry complete dog food). KAR will be looking after the dogs initially after they have been neutered but they have to be looked after in the meantime and of course what will happen to them long term. Ideally, a new home is the answer if anyone feels they can offer it. Cyprusscene want to help these poor animals who have had to be abandoned in much the same way that Hai and Yen were left high and dry. We heard that Yen was very upset at having to leave the 2 dogs but of course with the situation she and her husband found themselves in, they didn’t have any option. Although Chris and I do not have the time to physically go and help with the feeding we are donating a sack of dry dog food to help with their care. 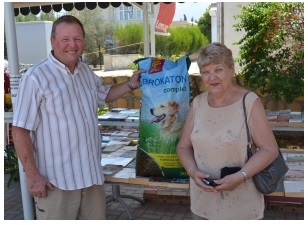 We met up with Steve at the Lemar Ҫatalkoy market on Saturday and handed over our donation of a sack of dog food. Steve and Vanessa were thrilled with this and said they have just had the kind offer of some help from an Australian couple who have just moved to the area close to Bamboo Beach and they will be more than happy to lend a hand with the feeding. That is really good news and will take a bit of the pressure off Steve, who says the dogs are still sitting and looking appealingly at the door of Hai and Yen’s house. A happy ending to this story would be for someone to come forward and take the dogs to give them a new home after they have been neutered. Steve would love to be able to give Yen the news that her dogs have been re-homed and this would really be the happy ending she is looking for. If there is anyone out there who could give a home to these lovely dogs please contact Steve or Vanessa on 0533 875 0849 (Vanessa’s number). So Steve, it seems as though you have yet another mission. Let’s hope you will be able to resolve this one as successfully as the first with the help of other caring people.